1. Sanctions on Iran; 2. The price of rice; 3. U.S. employment report. 1. The new round of U.S. sanctions on Iran, by Al-Jazeera. Also, this just reminded me of the upcoming presidential elections. BBC reports that all eight of the candidates are hardline conservatives, and that the progressive candidates were banned from running. 2. How Vietnam and Thailand try to stabilize the price of rice. According to data from the World Bank, in April the price of Thai A.1 rice was down 9.1% from last year, and the price of Vietnamese 5% rice was down 10.7%. 1. The change in nonfarm payrolls was decent (175k), even good in this post-2007 era. 2. Local and state government payrolls keep going up, albeit slowly, a sign that the fiscal consolidation at the local and state level is probably over. 3. Payrolls in the temporary help services industry ("temps") went up again, and the one-month diffusion of payrolls by industry was almost 60%. 4. The labor under-utilization rate (U6) went down, even though the unemployment rate went up, a sign that discouraged workers and people working part-time for lack of a better option dwindled in number. 1. Nonfarm payrolls for March and April were revised down by a net -12k. 2. Manufacturing payrolls have been declining for three months in a row. It is not clear whether this is a broad cyclical signal, or merely a sector story. 3. Federal government payrolls went down (although this was expected, given the fiscal consolidation under way). 4. The employment-population ratio is stagnant. It's been stuck at 58.5-58.6 since November 2012. 5. The six-month diffusion of nonfarm payrolls by industry declined in both April and May. The increase in the unemployment rate has both good and bad elements. On one hand, the labor force participation (LFP) rate went up, which might mean that more people are looking for jobs. 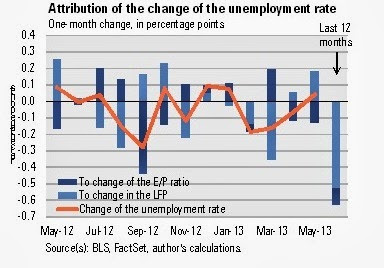 But an increase in the LFP pushes up the unemployment rate, ceteris paribus. On the other hand, the employment-population ratio (EPR) stayed level, which means that employment grew just as much as the population did. An increase in the EPR would have brought down the unemployment rate, ceteris paribus. A fairly positive report, indicating that employment keeps growing, albeit slowly, and that the slack in the job market is shrinking, slowly. However, the markets will probably zero in to the slight increase in the unemployment rate and hope for a delay of the Fed's tapering of QE. Clutching at straws, if you ask me. I will leave you with this chart. It shows what part of the change in the unemployment rate is attributable to the change in the LFP and which part is attributable to the change in the EPR. The sum of the two add up to the change in the unemployment rate. So, for instance, in May the unemployment rate went up by 0.04% (even though in the BLS report the reported rounded number is 0.1%). The increase in the LFP made the unemployment rate go up by 0.18%, whereas a slight increase in the EPR brought the unemployment rate down by 0.13%. The last column in the chart shows that over the last 12 months unemployment has gone down by 0.63%: 0.1% is attributable to an increase of EPR, and 0.53% is due to a decrease of the LFP.